For his wedding gift to Princess Elizabeth in 1947, the Nizam of Hyderabad opted for jewels from Cartier - gifts that were to be chosen by the bride herself. She selected two pieces from Cartier's existing stock, a diamond necklace and a tiara. 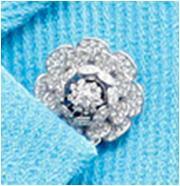 There is one large brooch and two identical smaller brooches. The Queen almost always wears the smaller two as a pair and the larger one by itself; the larger brooch is more frequently worn, though it is not among her most used pieces. The Nizam of Hyderabad necklace still remains. As it was a stock piece from the jeweler, it had existed for some years and had been sold and repurchased previously. At one point in time the central pendant was longer (containing three parts) and there were two additional pendants (each including two parts) on either side. The necklace had been simplified to its current form by the time it became one of the royal wedding gifts. As with many of her necklaces, the Queen did eventually shorten the chain to suit her tastes, and she still wears it from time to time today. It has been loaned to the Duchess of Cambridge, who wore the necklace for the first time in February 2014.